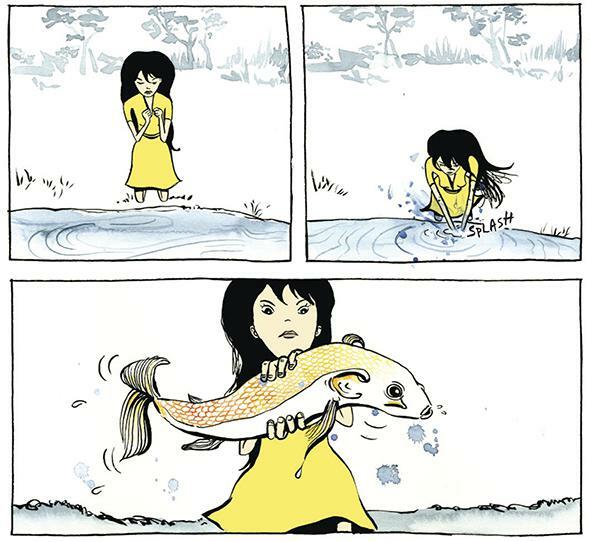 Danica Novgorodoff’s graphic novel The Undertaking of Lily Chen, reviewed. His brother’s dead, and now Deshi has to find him a girl—and it doesn’t matter if she’s a corpse. When his brother dies in an accident at the airbase where Deshi Li works, his enraged mother sends him on a quest. His brother needs a companion for the afterlife. Deshi must find a woman—the deader the better, though she doesn’t necessarily have to start out that way. Out in the countryside, Deshi meets Lily Chen, on the run from her family, clever and bad-tempered. What happens when she meets a young man desperate for a body—any body? Danica Novgorodoff’s new comic The Undertaking of Lily Chen is part Western, part ghost story, and part noir. It’s all original, though, shot through with spirituality and humor. Novgorodoff’s pen-and-watercolor art is vivid and vibrant, mixing traditional Chinese art techniques with clear-line cartooning to make a propulsive, lyrical story come alive. Ghosts haunt the edges of Novgorodoff’s artwork, but she keeps a close eye on her heroes as they come together, fight, and fall apart. The Undertaking of Lily Chen is a major new book from a major talent, and we’re proud to have Danica Novgorodoff illustrating the March issue of the Slate Book Review. The Undertaking of Lily Chen by Danica Novgorodoff. First Second.